Product #1680 | SKU 8-003-0107 | 0.0 (no ratings yet) Thanks for your rating! 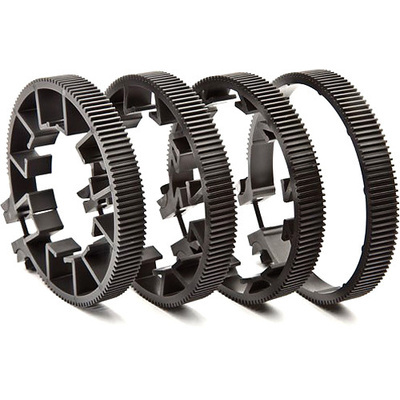 The microLensGears Kit (Black) from Redrock Micro includes four sizes of gears that allow the Redrock microFollowFocus to work with different sized still photography lenses for DSLR or videocameras, as well as some videocamera lenses. The four gears correspond to lenses with focus ring circumferences ranging from 180-320 mm. One of these four gears slips around the focus ring of your lens to give the gear of the microFollowFocus ( not included ) something to sink its teeth into, allowing you to adjust focus on the fly from the side of the camera. The gears are industry-standard film pitch (0.8 mod 32), and each features a multi-foot attachment that puts even pressure on the focus ring. microLensGears attach easily with no modifications to your lens.